We got home late Sunday night from our annual camping trip with friends (so much fun!) and jumped right into catching up on work and sleep, unpack the mountain of stuff we brought and cleaning the other mountain of dirty clothes we came home with, party planning prep for Griffin’s b-day celebration that’s happening tomorrow, and our usual schedule and life in general. After a few days of this the kids started to get a little restless (i.e. whinny and fighting with each other and who could blame them!?) so yesterday Johan and I decided it was time to divide and conquer. 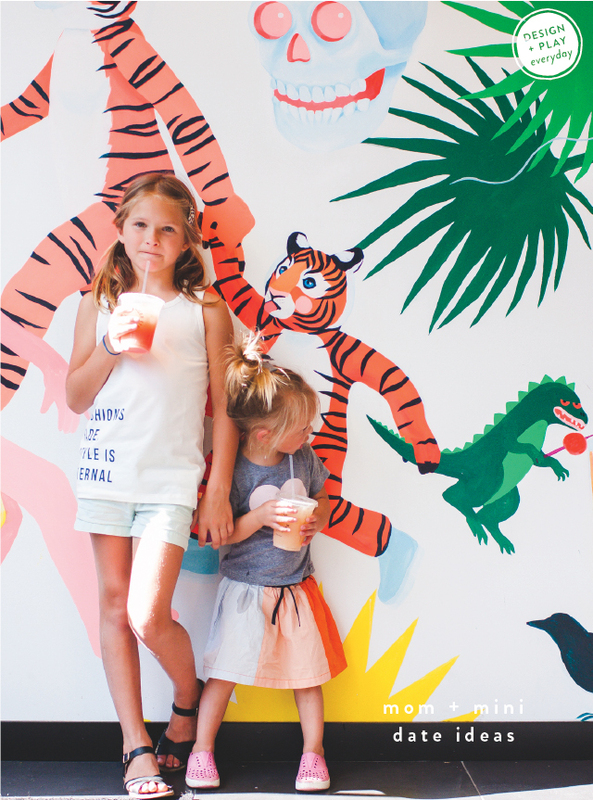 While he hung with the boys I took the girls on a little date to The Land of Nod for their summer camp craft time and a couple scoops of our favorite Molly Moon’s Ice cream. After that we did some shopping and then walked over to the new Rachel’s Ginger beer for a couple small drinks, before heading to Starbucks for our usual Bistro boxes to snack on while we drive home. As I walked at an incredibly leisurely pace from store to store with my girls, I thought about how much I needed this break from cleaning up the tornado that is our house, the constant beeping that comes from my phone, and the mile long to do list running though my mind, just as much as they did. In case you could also use a break from being pulled in 10 different directions, picking up the house, and hearing about how hungry everyone is, here’s a list of mom + mini date ideas to help inspire a little quality time! learn something new together — a trick, knitting, dance moves, twisty balloon animals, etc. at home spa or nail night… you might have seen johan’s impromptu spa night on Instagram stories last week. so funny. I always feel like the best version of myself when I’m able to be present with my kids, husband, work, friends, and even strangers, but it’s been such a challenging thing for me to do during the summer months (which is going way too quickly, btw!). Wish I could soak up the sweet moments and laughter and just play 24/7, but keeping up with work and order is also good, right?! How do you find that rhythm between checking things off the to do list and making time to play? I would also love to hear your favorite kid date ideas too!? My guys are older but they still love to hang with their parents. I love surprising them with movie dates especially when the superhero ones come out.